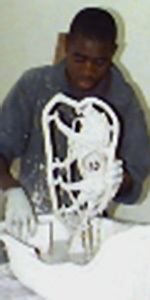 After approval, I made a two piece mould and plaster jacket. Years ago, my moulds were so poor due to lack of knowledge and experience that I would end up spending two days on each wax and the moulds, just tidying them up. Time has taught me that concentrating on the quality of the mould will result in minimal attention on the wax models themselves. I use a succession of chip frying pans to melt the wax before pouring it into the mould. I then roll it around and tip the excess out. 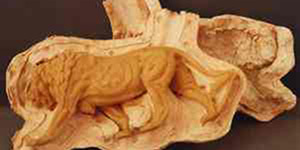 I do this three times to make a hollow wax model. On completion of the wax model, sprues need to be attached. This is an art in itself. Every founder has a different method. 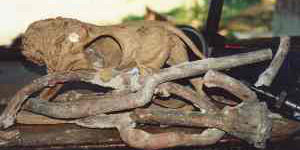 The fat rods allow the bronze to feed the model and the thin ones allow the gases to escape. Trial, error and a lot of ‘short runs’ later – my sprues always allow the bronze to go somewhere – there are no dead ends. 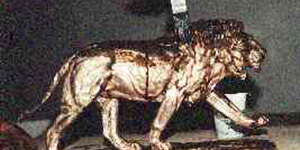 A patch from the side of the lion is removed so that the slurry can coat the inside as well as the outside. 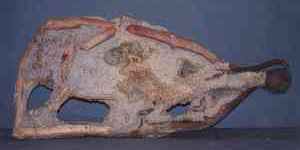 The patch is sprued to the side of the tail so it can be made along with the rest of the lion and attached by welding at the end of the process. Dipping into colloidal silica slurry – the secret here is not too thick and not too thin and sprinkle with silica sand. Nine coats later produces a ceramic shell sufficiently thick to withhold the molten bronze. This is the melting away of the wax. This must be a hot and quick process. A New Zealand friend of mine holds the shell in one hand and the gas torch in the other. 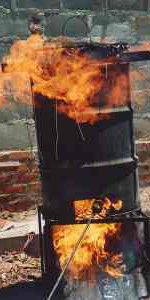 This entails too much risk of being burned, so I prefer an oil drum and a large gas torch – a lot safer! Once all the wax is burned out, you have an empty shell. 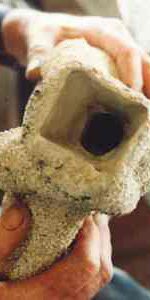 The ceramic shell now has a void where the wax was and thus this method of casting is known as the ‘lost wax technique’. 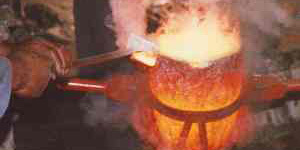 The bronze is melted in a crucible in the centre of a coke furnace. Gas, paraffin, diesel or induction furnaces can also be used. This is always exciting no matter how many times you do it. 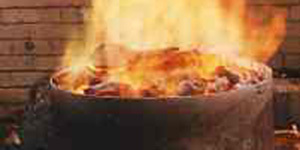 The orange-red molten metal in the crucible is lifted from the furnace and put in the basket and then poured into the shells, which are bedded firmly into sand. 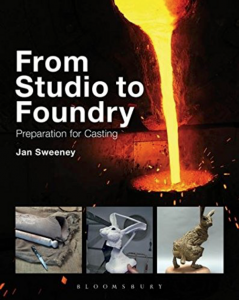 If the bronze keeps pouring and the mould does not fill up – panic, you have a crack! The bronze is running out into the sand. 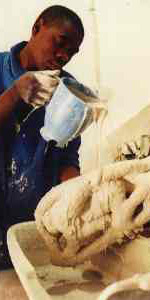 Now the boring bit – removing the ceramic mould from the cooled bronze. 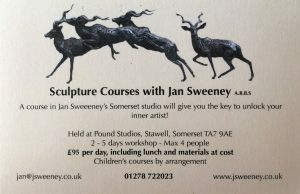 This is done by painstakingly removing the ceramic with a hammer and chisel and must be done without marking the bronze. The sprues need to be removed. 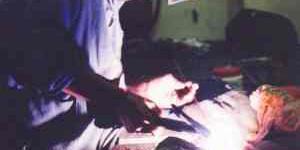 This is done by carefully using an angle grinder ensuring no flat edges are left behind. Final touch ups include fettling with air tools, small tips, wire brushes and sand blasting. The clean bronze is now welded to close any holes (intentionally there for the drying process when making a ceramic mould). 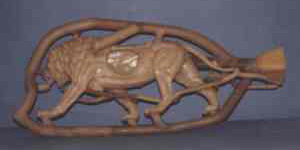 The patch on the side is replaced and the lion welded to the base. Again, fettling is done on the newly welded areas. 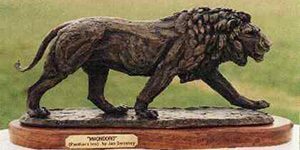 The finished bronze is wire brushed and patenated with acid to give it the desired colour. 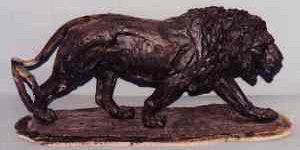 The bronze is then polished, attached to a wooden base and named.